It also provides an excellent fibre source for competition horses being fed high levels of concentrates. Being particularly low in sugar and starch and high in fibre. High Fibre HorseHage and also Timothy HorseHage are suitable for feeding to horses and ponies prone to laminitis. This is indicated by the HoofKind logo on their packaging. High Fibre HorseHage is made from the same ryegrass mix of grasses as Ryegrass HorseHage, but is cut at a later stage of growth, so that the resulting forage is lower in protein and higher in fibre. 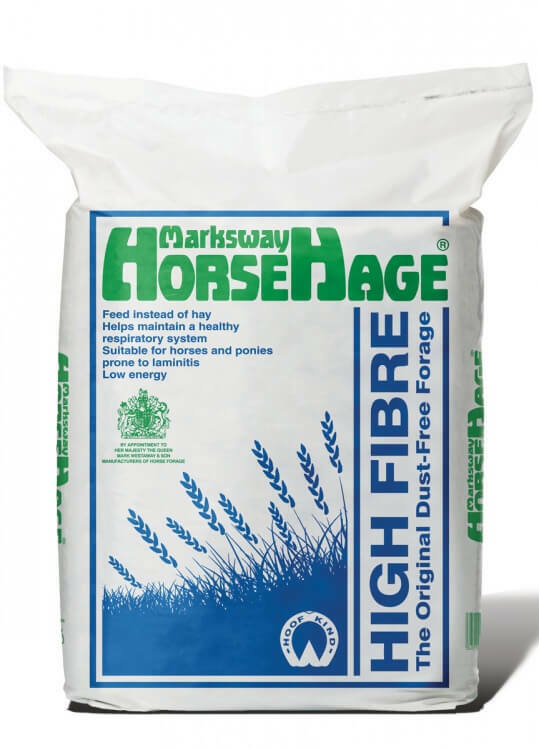 HorseHage High Fibre is known by many of our customers as ‘HorseHage Blue’ because of its bag colour. HorseHage High Fibre is usually deep gold in colour with a coarser texture than Ryegrass HorseHage and has a pleasant, sweet aroma. * MAD Fibre – Modified Acid Detergent Fibre (This is a measure of the digestible part of the total fibre in a feed).